Buoyancy control is one of the fundamental dive skills. Without an ability to adjust our position in the water column we would either remain stuck at the surface or be reduced to crawling along the bottom like some mud dwelling crab. Our ability to move weightlessly through the water is one of the most liberating and enticing elements of diving and yet it is a skill that many divers have not fully mastered. I believe there are a several specific reasons for this.Firstly it comes down to your instructor; how much emphasis does he or she place on good buoyancy control? Many introductory diving classes are taught with the class kneeling on the bottom. The reason for this is that with large groups it is far easier for the instructor to keep control if the students stay in the same place. I’ve even heard some instructors tell their DMs to overweight the students to keep them on the bottom! Of course all classes require buoyancy control skills to be taught, but because it is a skill that requires time to master it is often left to the end, so that the rest of the class is not delayed. Does this provide the right message for the students?Secondly when buoyancy is taught it is usually done in a manner inconsistent with actual diving. Students are asked to hover for a specified time, usually without moving either hands or fins – but this hover can be done in any position. Until I learned better one of my favourite party tricks was to get students to hover in a Buddha position – it looked cool but was it actually any use when diving? Buoyancy needs to be taught and mastered with students hovering in a horizontal position, which is how they should be diving.Thirdly buoyancy is usually only taught without any other form of task loading and with plenty of visual references. Clearly students need to master this first, but everyone (instructors included) needs to appreciate that hovering in a swimming pool without having to do anything else is only part 1 of the story. 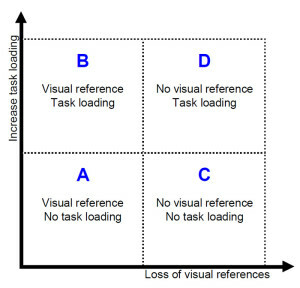 They may think they have great buoyancy (when measured against their students) but most instructors that enrol on my tech classes have great difficulty hovering once visual references are removed and they start to become task loaded.So how do I measure how good my buoyancy is?Think of buoyancy as falling into four different areas, as shown on the diagram below. Most divers, once they become comfortable in box A would consider themselves competent at buoyancy control. However, as you move along one or other axis buoyancy control becomes harder. Think of box B as having to achieve some task whilst underwater, maybe deploying an SMB or practicing an out-of-gas drill at the bottom. Are you comfortable doing that? Think of box C as the process of learning how to do blue-water ascents and maintaining your depth. Are you still comfortable? 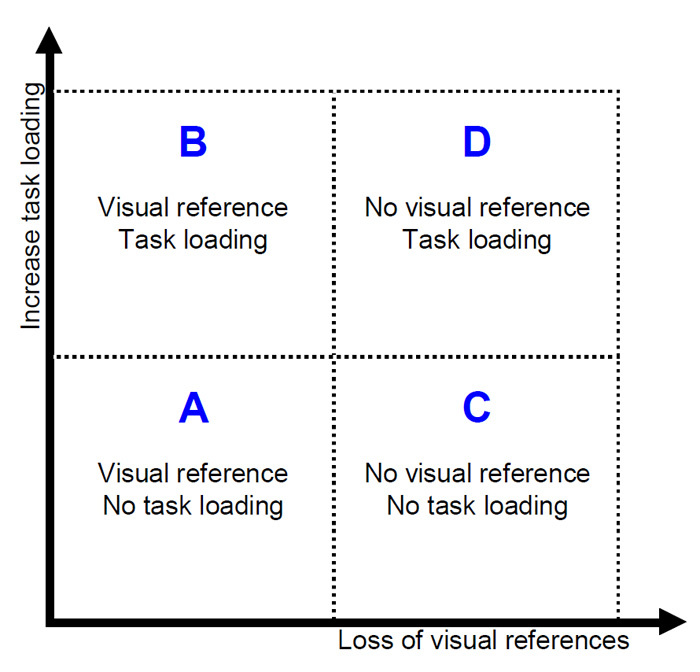 Divers or instructors whom we perceive as highly skilled are usually very comfortable in either box B or C, but it is box D where the real challenge and real skill is displayed. Be honest with yourself, can you launch an SMB from mid-water whilst maintaining team integrity and hitting all your required decompression stops? Comfort in box D is how I define good buoyancy control. Unfortunately there are no shortcuts to becoming great at buoyancy control. Your best option is to find ways to practice it on every dive. Try to do all you ascents without holding onto the up line; see how much you can manage your depth with just your lungs (NB: No holding your breath as you ascend); try to anticipate when you will need to add or vent air – before your wing starts to lift you or your ears start to hurt. Basically there is no alternative to practice – however if you find ways to include practice naturally then it doesn’t need to interfere with your diving. Your aim – to become the master of box D!